Ram trucks have always been the top choice for pickup drivers and enthusiasts everywhere and the Ram 2500 is the prime choice for a truck that can handle heavy-duty jobs, while looking classy and refined. Its towing and hauling capabilities are one thing, but the technology features on the Ram 2500 make any day on the job feel like a day at the park. Here’s a look one of the Ram 2500’s nicest and most well-equipped truck trims, the Ram 2500 Laramie Longhorn. The Ram 2500 Laramie Longhorn is powered by a 5.7-liter V8 HEMI VVT engine that generates up to 383-horsepower and 400 lb-ft of torque. However, buyers have the option to switch to a 410 horsepower 6.4L HEMI V8 engine or a 6.7L Cummins Turbo diesel engine for a little more power or torque. A 6-speed automatic 66RFE transmission is standard, but if preferred, the 68RFE model is an option. The towing capabilities of the Ram 2500 Laramie Longhorn varies on the engine. If going with the standard 5.7L Hemi V8, drivers can expect a maximum towing capacity of 13,890 pounds and a maximum payload capacity of 2,340 pounds. The 6.4 HEMI V8 bumps up to a maximum towing capacity of 16,320 lbs. The extra torque in the 800 lb-ft of torque Cummins Turbo Diesel engine delivers Best-in-Class maximum towing capacity of 17,980 pounds. As mentioned, the 2016 Ram 2500 Laramie Longhorn is equipped with luxury features. Both, the front seats and second-row seats are heated, so drivers can stay toasty and comfortable on the long hauls at night or in the winter. The seats are also covered in premium Filigree leather and ventilated. There’s also a convenient storage compartment under the seat. In terms of technology and convenience, the rearview mirror auto-dims, and it has a microphone built-in for the hands-free Uconnect system. 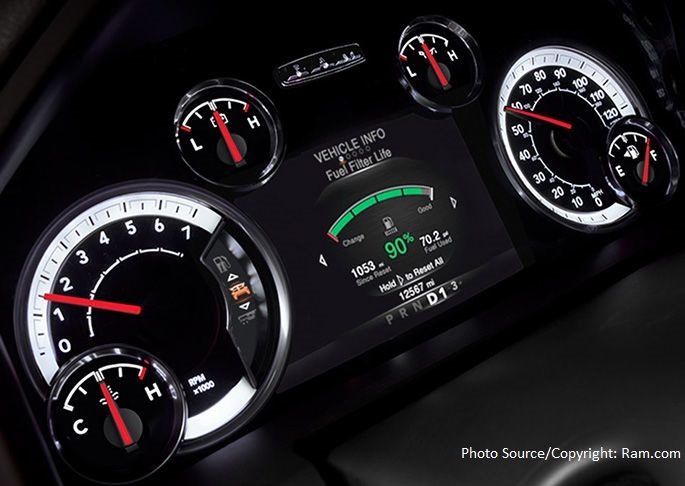 Like most trucks, the Longhorn comes with an electronic vehicle information center so drivers can easily keep an eye on their truck stats while on the road. An 8.4-inch touchscreen display is located at the center of the dashboard, and the sound system is a 9-speaker Alpine system with a subwoofer. GPS Navigation is included, along with Uconnect 8.4 NAV and uConnect Access. A 5-year travel link service with SiriusXM also comes with the truck. The truck rides on 18-inch rims, but 20-inch rims are also an option and both are fitted with Firestone all-season brand tires. In case of an emergency, a full-size spare tire is included. For added convenience, the tailgate has a lock feature, and lamp has been installed under the hood, so drivers have a little light if they need to access the engine compartment in the dark. Ram 1500 trucks come with all the usual safety features: advanced multistage airbags powered by a system that measures impact severity and the force needed when deploying the airbag, electronic stability control, side-curtain airbags, and speed control. The Laramie Longhorn also has ParkSense front and rear park assist systems, a ParkView rear back-up camera, remote keyless entry and start-up system, and sentry key theft deterrent system. That means the truck won’t start without the proper key. A DOT certified roadside safety kit is another add-on option, complete with reflecting triangles, a fire extinguisher, spare fuses, and two red vinyl flags. The starting MSRP of a 2016 Ram 2500 Laramie Longhorn is $52,215 before optional add-ons. It’s backed by a basic warranty for 36,000 miles or 3 years and there is also complimentary unlimited roadside assistance for 100,000 miles or 5 years. 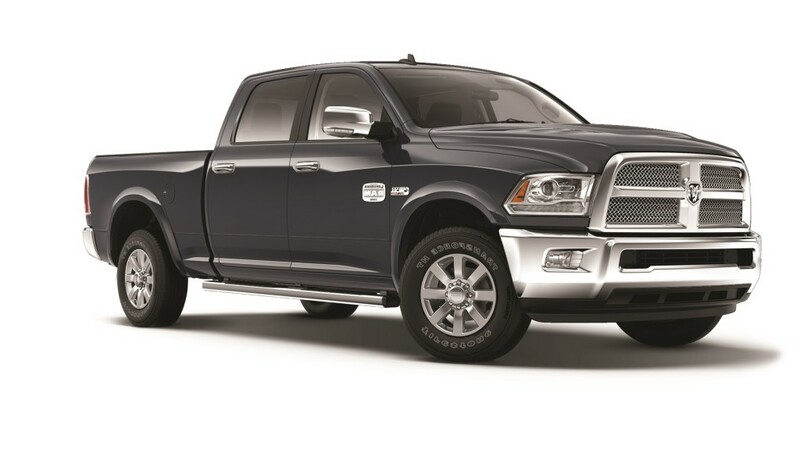 Where to get a 2016 Ram 2500 Laramie Longhorn? At Aventura Chrysler Jeep Dodge Ram, we have a wide selection of trucks. Feel free to check our inventory online, or call us and swing by to find out what we can do for you.